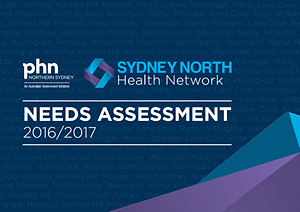 Sydney North Health Network (SNHN) is pleased to announce the publication of its first Needs Assessment report. The report highlight’s the general population health profile for the region, covering 73 separate health topics. The report was drafted following a process of analysing relevant and current local and national health data; reviewing local service provision and consulting with the community. It was delivered to the Australian Government earlier this year and is now available for public record. It should be noted that as a core element of phn activity, regular Needs Assessments will be developed to reflect latest and updated data and information on a population level. A core function of a PHN is to perform regional population health based profiling and identify priorities to increase the efficiency and effectiveness of medical services for patients, particularly for those at risk of poor health outcomes. In understanding our region’s need, SNHN can then commission local health services to meet the identified health needs of our most vulnerable and at-risk groups. SNHN will start its commissioning work this July. On the surface the SNHN inaugural Needs Assessment reveals a population demographic that appears to enjoy relatively good health with the highest life expectancy in Australia and premature mortality the lowest in the country. Indeed this is good news. However scratch beneath the surface and the story is quite different. The report finds a changing, growing and ageing demographic that across the age ranges is facing a number of health challenges. There are at-risk population cohorts, geographic hot spots and specific health issues. Pockets of disadvantage also co-exist among the affluent within a number of suburbs. There are issues relating to the impact of the social determinants of health, such as access to primary care, stress and addiction, which can impact health outcomes. Specific detailed investigation into Mental Health, Urgent Care and Health of the Elderly were identified by both preceding Medicare Local Needs Assessments, and by our partner, the Northern Sydney Local Health District (NSLHD), as the top areas for health concern in the region. These findings were confirmed by the SNHN Clinical and Community Councils. A thorough understanding of our local populations health needs will mean SNHN can target its work to the areas that are much needed and commission services that will ultimately lead SNHN and our primary care partners towards achieving together; better health, better care for our community. The SNHN population aged 65+ years is projected to increase by 43% between 2016 and 2031 (1.1). Compared to NSW, a larger proportion of the SNHN population is born in countries culturally and linguistically different from Australia (1.2). Over 2,400 people in the SNHN region identify as Aboriginal and/or Torres Strait Islander, however, the population appears to be significantly under-reported (1.4). The SNHN population is relatively less socio-economically disadvantaged compared to NSW and Australia. Pockets of high disadvantage in the region are obscured by the overall high level of advantage in the region (2.1). The proportion of children living in welfare-dependant families in the SNHN region is low compared to NSW, however, this still amounts to over 11,700 children in the region (2.4). The average life expectancy in the SNHN region is the highest in Australia, and the premature mortality rate is the lowest. Males have a lower life expectancy compared to females (3.1). Nationally, life expectancy for Aboriginal and Torres Strait Islander peoples is approximately ten years lower compared to non-Indigenous people (3.5). The SNHN population ranks relatively low on most risk factors, but still has an estimated 67,000 adult smokers and 102,000 adults who are obese (4.1, 4.3). The SNHN region has a higher rate of alcohol attributable hospitalisations compared to NSW, particularly in Manly, Mosman and Lane Cove LGAs (4.2). Within the SNHN region, 40% of the population has one or more chronic conditions (5.1). GP attendances are lower in the SNHN region compared to NSW (6.3). Cellulitis, kidney and urinary tract infections, and dental conditions make up 40% of potentially preventable hospitalisations in the SNHN region (7.2). Within the SNHN region, 12% of people report having a long-term mental health condition (8.1). Emergency department presentations relating to self-harm or suicidal behaviour are particularly prominent for young people aged 15-19 years, averaging over one presentation per day in the SNHN region (8.11). Intentional self-harm is the leading cause of death in young people aged 15-24 years in NSW (8.12). Within the SNHN region, the 0 to 4 years and 80+ years age groups had the highest rates of emergency department attendance of all age groups in the SNHN region (9.3). A third of all Aboriginal people attending emergency departments in the SNHN region came from LGAs outside the SNHN region; twice the rate of the non-Indigenous population (9.7). The SNHN region has the highest rate of GP after-hours/emergency providers in NSW. Despite this, the region has a lower rate of patients who access GP after-hours services compared to other PHNs (9.10). An estimated 80% of SNHN residents aged 75+ years did not receive an annual health assessment, of whom at least 41,000 are likely to have two or more chronic conditions (10.3). For SNHN residents aged 75+ years, 12 in every 100 presentations to an emergency department is due to a fall (10.6). CLICK HERE for the Needs Assessment Report.